Description: A spiny climbing shrub with leaf-like rudimentary branchlets (cladodes) arranged in whorls. Cream-coloured and highly fragrant flowers emerge in dense spikes along the stem. Fruits are small, of the size of black pepper, and turn red when ripe. 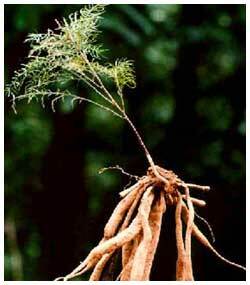 The plant has got a tuberous rootstock having 10-25 cylindrical tubers. How to Grow: For Home Herbal Garden, one plant in a pot size of 25 to 30 cms is adequate. It can also be planted in the ground. Being a climber, it can be trained around pillars or along fences. It can also be raised in hanging baskets. Care regime: The plant likes sunlight and thrives well in hot and dry conditions. When planted in the ground it needs occasional watering, while in pots, watering twice a week is adequate. If kept under partial shade, it needs to be brought to direct sun every two to three days. This plant being spiny, needs to be kept away from the reach of children. Collection: Root tubers can be collected from a year-old plant. If it is planted in the ground, a C shaped pit can be dug around the plant and a few tubers can be collected without uprooting the plant. Pit is then closed and watering done. Similarly, tubers be harvested from the potted plants by removing the pot mixture from one side and re-filling the same after removing a few tubers.